My name is Siyabonga Mbaba. I am from Khayelitsha, but I was born in Joburg on the 20th of July, 1993. I am 23 years old. We moved to Cape Town when I was six years old for my stepdad to pursue IEC soccer. While playing soccer, my father was working, doing part-time jobs and my mother was a domestic worker. She’s still a domestic worker. I went to different primary schools in Khayelitsha, until Grade five, when I moved to Chapel Primary School in Woodstock. My parents wanted us to go to a multiracial school so that we could learn how to speak English and interact with people from other races. Unfortunately, I was exposed to peer pressure there and started to smoke. Then my parents decided to take me to Joburg again. I met my biological father when I was 18. I wanted to go to initiation school so I went to the Eastern Cape and that’s how we met. We only spent a month together and I haven’t seen him since. That was in 2014. There were many challenges in my life growing up. Many children in South Africa do not live in traditional nuclear families with both a mother and father present. In fact, only 35% of children live with both their mother and their father. It’s more common for children to live only with their mother (39% of children), while it is unlikely that they will only live with their father (3%).. Increasingly, studies are showing the positive effects of engaged fathering on child outcomes. This does not always need to be a biological father but it does raise the question of how to increase the presence of positive male role models in the lives of children and young adults. 1. Meintjes, H, Hall, K.and Sambu, W. Demography of South Africa’s children. South African Child Gauge 2015. 2. Ward, C, Makusha, T and Bray, R. Parenting, poverty and young people in South Africa: What are the connections? South African Child Gauge 2015. In Joburg I was exposed to drama, poetry and music. I fell in love with music. I fell in love with art. A year later I came back to Cape Town and I went to Mitchell’s Plain Cedar High Art School. There I did music, dance and theatre. 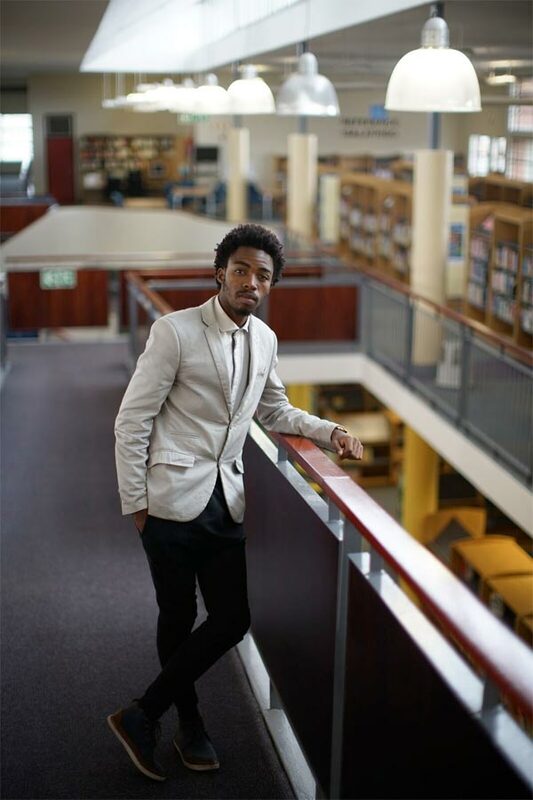 I started performing at theatres – Baxter Theatre, Artscape, Magnet Theatre. So that’s where my passion for performing art comes from. I didn’t do well in Matric. Actually, I failed Grade 12. But I didn’t give up on life. I decided to do something that would help me to grow as an individual and help my family at the same time. I looked for a job but I couldn’t get one because I didn’t qualify. So I approached loveLife (an NGO and youth development campaign focused on preventing the spread of HIV and Aids among young people). I told them that I wanted to start my own organisation called Iphuphalami Improvements. I didn’t tell them that I don’t have a Matric, but I did tell them I had this vision, and told them what I wanted to do. They liked the idea and they liked the way I was thinking. They approached me to become a groundBREAKER (stipended youth volunteers who are part of structured youth development programme), but after six months they called me and told me that I don’t have Matric and thus don’t qualify to become a groundBREAKER. They said I could become a Mpintshi. A Mpintshi is an unstipended volunteer assisting the groundBREAKERS. I didn’t like being that low. I want to manage my own time, I want to implement my own ideas, I don’t want to be told what to do. So I decided not to be part of loveLife anymore. So after that I was at home for three months doing nothing, just being depressed, thinking about life, hating myself and the way I grew up. Only a third of young people who started Grade One 12 years ago, pass their Matric exams. This is a massive systemic failure, with significant implications for the work and study prospects of these young people who do not manage to complete their schooling. Hall, K. Children’s access to education. South African Child Gauge 2015. It is extremely difficult for young people with less than a Matric to find employment. The unemployment rate among this group of young people sits at the incredibly high figure of 57%. Compare this with university graduates who, with an unemployment rate of only 1%, are the least likely group to be unemployed. Statistics South Africa. 2016. The Social Profile of Youth, 2009–2014. I’ve learnt that in black schools they teach children to become slaves. They teach them how to become employees, to work for someone, but when you go to model C schools or to white schools, they teach children how to start their own businesses and become independent. So that’s one of the things I hate about school, specifically black schools in the townships. The problem is that in the township, after people study and start their own companies and become successful, they go and stay in the suburbs. So in the township we don’t have positive role models. Those guys who steal cars are some people’s only inspiration – showing that to be successful in life, you have to steal cars and do that stuff. The transition out of school was a good experience for me. I don’t think you need education to become successful; it’s all in your brain, it’s how you think. Some people become successful because they’ve studied and whatever, and some people because of the drive they have. They have a vision for their lives. … and then don’t be lazy. Plan something for your life, explore life and go to other places. Get out of your comfort zone and start your own thing. Always be willing to learn and attend workshops. Education is not something that you get at school only; you also learn through your mistakes, and you also learn through other people. I wouldn’t say I had a role model. That’s one of the reasons I wanted to start my own thing. I want to be the mentor that I never had. My vision is to see Khayelitsha having a theatre, an art gallery, and a dance studio. I want to see Khayelitsha having its own museum, something that will tell a story about Khayelitsha. I started an art group called Ingangemano. We are doing poetry, dance, music and we are planning to teach contemporary dance at schools. I also started my own company, Iphuphalami Improvements. ‘Iphupha’ means ‘dreams’ and ‘lami’ (like ‘iphuphalam’), ‘my dream’. We all have dreams, we all want to become someone in life, we all want to be famous, have degrees and have big cars and be celebrities. Everyone has different dreams. We do art exhibitions as well as business expos. We want to help those who have dreams. A while ago we organised a pop-up art exhibition in Khayelitsha. I didn’t charge anyone for it because we’re still introducing the concept in Khayelitsha. We have photographers and actors and visual artists who come from Khayelitsha, but they prefer to go to town and exhibit their work there because they believe tourists will buy their work. In Khayelitsha, some people are not educated about visual art and photography. 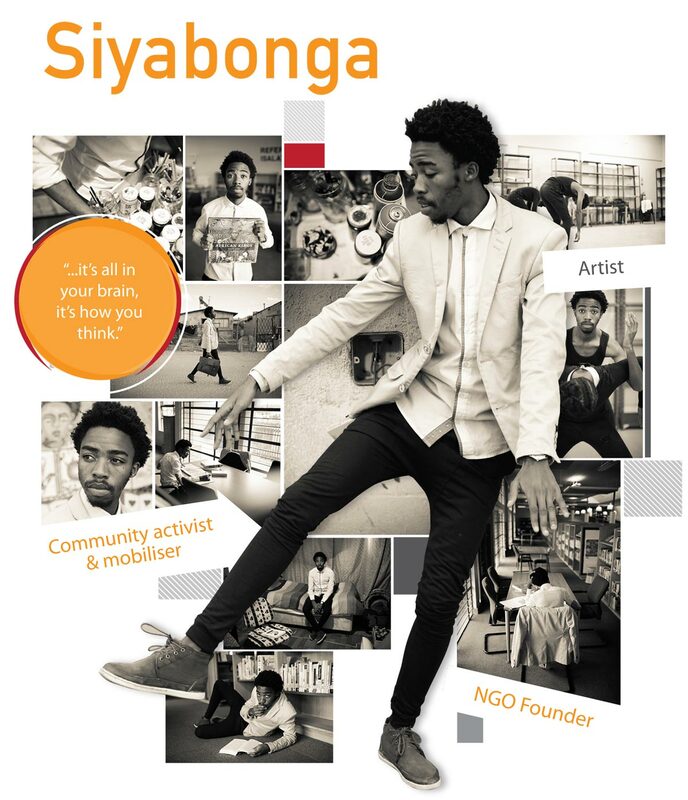 We are trying to bring resources to Khayelitsha and to educate people about art. I used to do work for free but I’ve learnt that I have to charge people for my services and for my ideas. At the moment I don’t have any income. I just do volunteer work. I’m working with the Mathando and Abaphumeleli orphanages. We are doing reading clubs and I do the administration for Mathando orphanage. I also still go to my high school and direct some theatre works. This year I have to come up with a plan that will get me an income. 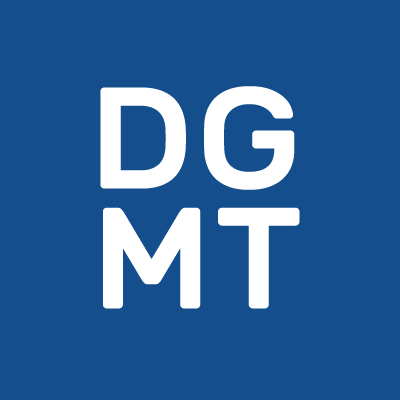 I want a business mentor – someone who is going to focus on my business, on how to grow a business. And I want a personal mentor, someone who is going to focus on me and give me guidance on life. I’m a human first. Before the career, I’m human. I’m also involved in the Activate! Youth Leadership Network. I have just started, but I’ve already met people with a similar vision to mine. So it helped me to realise that in order to pursue my vision I need other people – and I met them at Activate! So I have to make sure that my company has an income and also that there are people who I can trust to help make my vision come true. Then I need to further my studies. That’s the plan. I love film. I would love to go and study film but you can’t do everything at the same time. That’s the thing about life. Research shows the value of mentoring to help young people do well on the life transitions that shape their lives. Read more about mentoring young people here and access easy-to-use mentoring/coaching guidelines here. Despite the bad press that young people get suggesting that they are lazy and lacking initiative, the evidence shows that South Africa’s youth are socially and civically engaged. For example, 41% of young people aged 18-29 years have volunteered for a charity. Read here about how volunteering can be a valuble experience preparing young people for formal employment. 1. Burns, J., Jobson, J. and Zuma, B. Youth identity, belonging and citizenship: Strengthening our democratic future. South African Child Gauge 2015. I think my neighbourhood inspires me to do the things that I do because I get the ideas from my township. I look at the problems in my neighbourhood and come up with solutions. In the township I have learned about life and about not getting tempted by unimportant things. A typical day for me… I’ll be dancing for most of the day, then I’ll go to meetings and to schools and do workshops and go to Mathando orphanage and do something, maybe cook there sometimes. There’s a lot that I do… I’ll go to music rehearsals too. My two sisters and mother are most important to me! I want to be a role model to my two sisters. I don’t want them to miss opportunities. I want them to be exposed to different careers so that when they are older, they can make the right decisions. I don’t want them to grow up in Khayelitsha. I want to work hard so that when they attend high school, they go to a proper school. After high school, I don’t want them to go back to Khayelitsha, they should live a good life. I want to teach them respect. I want them to know their background and understand it and also be willing to help other people. I think a better life is being able to buy things that you want without looking at the price. Also being with people that you want to be with and going out and having fun. Going to casinos if you want to, clubs, theatres. That’s how I see a better life. At the moment I’m still struggling. Let’s say my friends want to go to Grand West. I can’t say ‘let’s go there’ because I don’t have a car. I don’t have an income. I can’t afford that life at the moment. I want my sisters to do whatever they want to do and also I want them to have access to resources. My stepfather made me the person I am. He taught me respect, he taught me how to behave as a man, how to treat a family and work for the family. He taught me about culture, he taught me about God, he taught me everything. He was a taxi driver taking people from Khayelitsha to work. He got shot in 2009. That’s how he died. After that we struggled a lot. He was working hard to make sure that we had something to eat at home. He had two jobs. When he died, we couldn’t manage. My mother was also unemployed for five months. We used to survive through the grant money. Then she got a job as a domestic worker. She wants me to go further with my studies, but I want to finish what I started and then go to school. My mother is one of the people that I am proud of. She had me when she was 14 or 15, she raised me no matter what was happening. She’s a domestic worker because she wanted to make sure that we have something to eat. She took me to school and she supported the things that I do. I’m grateful to her. While the percentage of youth living in poverty has declined since 2008/9, there are still approximately 54% of young people who live below the poverty line. About 15% of young people live in households experiencing hunger. While the figures for teenage pregnancies are declining in South Africa (from 42% in 1984 to 30% in 2008), there are still many children who are born to very young mothers. This has a number of negative consequences for the mother – her chances of school drop-out are higher, she has an increased risk of depression, and is likely to attain lower levels of education. This has a knock-on effect for the children who may experience health, developmental and/or behavioural problems. Ward, C, Makusha, T and Bray, R. Parenting, poverty and young people in South Africa: What are the connections? South African Child Gauge 2015. Before I perform, I have to write everything down. I express myself best in writing, especially in isiXhosa. I write my own content and then I go to a poetry session (maybe poetry slam) and express myself there. But when it comes to having a conversation, it is difficult. Especially when I have to speak English because I think in isiXhosa and then I have to make an effort to translate that into English. If I’m with many people and I have to speak English and express myself in English, it becomes a problem. Even though I perform in both English and isiXhosa. I love English though, I love isiXhosa, I love language. But even with isiXhosa, I’m not speaking the real Xhosa, that deep Xhosa. My drama teacher also influenced me in life because he loved what he was doing and I shared his passion for dramatic arts. I knew him from Grade 8 to Grade 12. He guided me in my art. I feel happiest when I have a vision and see it happening. I had a vision for the art exhibition to happen and I made it happen. Also I see Iphuphalami (my career guidance company for young people) happening and that makes me happy. But, in order to live, you need money – my finances are a problem. If you don’t have money, you don’t always have confidence to do what you want to do because you can’t afford it. Sometimes I struggle to go to town. When I was still at school, I struggled to go to school. Money continues to be a struggle. My mom is living her own life now, so I have to come up with a plan to get money and move out of home and start my own life. Findings presented by the University of Johannesburg from the Centre for Social Development in Africa (CSDA) research on youth unemployment, found that just looking for a job is extremely costly, with the average monthly cost of job searching and applications being more than R800 (including transport, getting information, making applications; interviews, etc.). I want to be remembered as someone who helped to bring change to Khayelitsha. People must not be afraid of coming to Khayelitsha. I want to see Khayelitsha as a safe place, a place where people want to come, a place where tourists will come every day. I want to see corruption decreasing in Khayelitsha. I want to see people pursuing their dreams. I want to see high-school students knowing what they want to study. 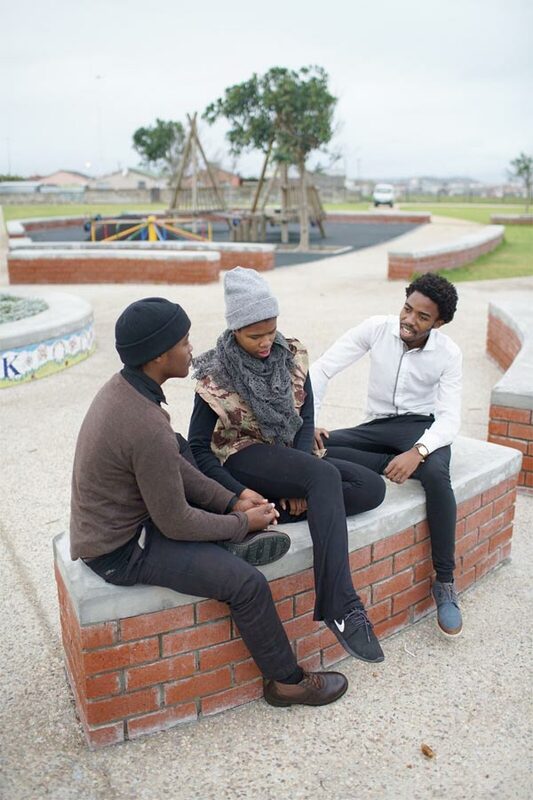 I want them to be friends with people from other races, to explore other places, not to be boxed in Khayelitsha. In order to understand life, in order to understand yourself, you have to explore life… but to do this you have to move around.